HDAM-SA2 modules make standard counted sound feel as incredible as high-resolution audio. This new amp also gives you the unique Marantz Musical Digital Filtering (MMDF), with two selectable filter characteristics to cater for different tastes and music. Each handles even the minutest of detail with loving care within the digital audio signal. 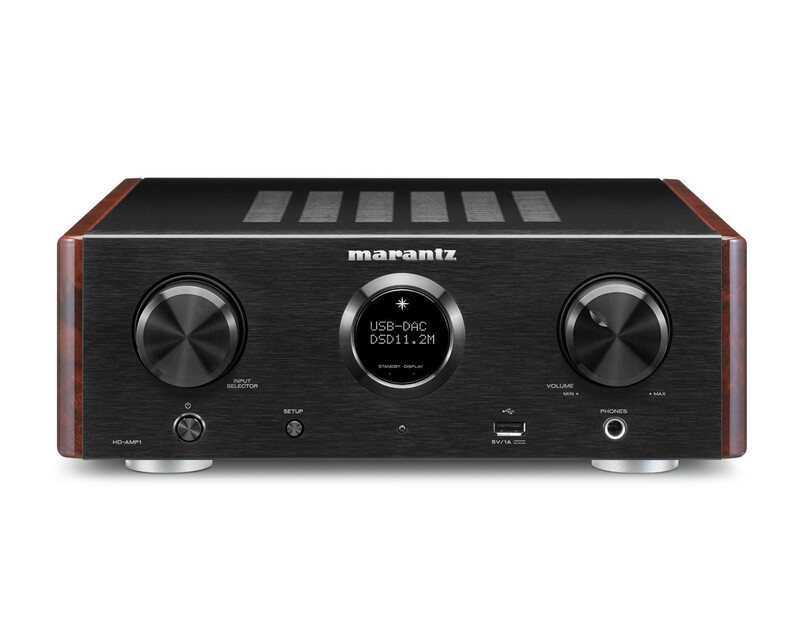 As today’s new media not only comes in 44.1kHz/16 bit resolution – similar to the CD format, Marantz developed the digital section to handle signals of up to 384kHz/32bit resolution and DSD 2.8MHz / 5.6MHz / 11.2MHz. Optical and coaxial digital inputs are ready to connect a TV or set-top box, and there is a USB-B port to stream music directly from your PC or MAC. iDevices can also be connected via the USB port on the front. To safeguard quality when connected to a computer, we built extended isolation around the USB-B input to eliminate the chance of high frequency noise generated by the computer entering the HD-AMP1. Information on volume, input, resolution, and more is shown on the stylish Marantz Porthole Display. While the solid aluminum front is supported by a double layer bottom plate and retro-style side panels. Welcome to the world of compact ecstasy. 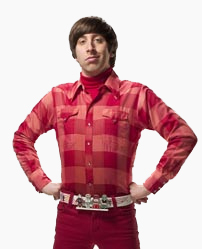 Don’t get misguided by the compact form factor. The HD-AMP1 delivers 2x 70 W into 4 Ohms, playfully handling even demanding music parts thanks to an ultra-stable power supply and Marantz own Current Feedback technology. The Dual Crystal Clock and a discrete DAC post filter with the company’s highly-acclaimed HDAM pre-amplifier modules make standard counted sound feel as incredible as high-resolution audio. A high-current audiophile SABRE D/A-Converter with no less than 384kHz/32bit processing capability is able to reproduce even the smallest details with ease. The HD-AMP1 features the unique Marantz Musical Digital Filtering (MMDF), inspired by audiophile reference class technology. For Marantz, using standard digital filter solutions is not an option, as this filtering is crucial to the sound reproduction of digital input signals. 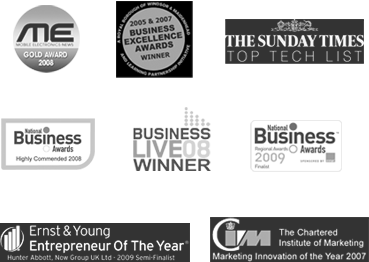 As a result, the company invested extensively in gaining expert knowledge, leading into highly-acclaimed Marantz Music Mastering technology used in award-winning Premium Range 11 Series products. Adapted for the HD-AMP1 hardware design, the new solution is called Marantz Musical Digital Filtering. Two selectable, digital filter characteristics cater for different tastes, and each handles even the minutest of detail with loving care in the digital audio signal, transforming new media files into the finest of high-resolution playback. The HD-AMP1 is the first ever Marantz Hi-Fi product that incorporated the concept of a switching amplifier. Up to now, switching (Class-D) amplifiers did show certain limitations which made them not acceptable for demanding Marantz sound engineers to be used in a premium Hi-Fi product. 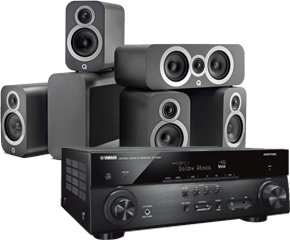 Now, the HD-AMP1 combines the unique Marantz HDAM technologies, the switching amplifier concept and an overall feedback loop, to guarantee a consistent performance with a wide range of loudspeaker types. Compared to regular switching amplifier concepts, the HD-AMP1 does not take the feedback signal at the output of the amplifier module, but right after the LC filter stage. 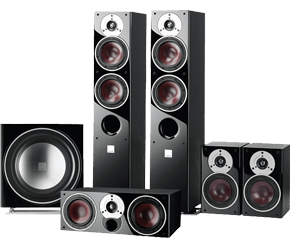 In case the feedback is taken before the LC filter, the connected speaker is not taken into consideration in the amplification process, hence the amplifier reacts very sensitive to the connected speaker, and performance varies. With a carefully designed switching amplifier and the feedback taken after the LC filter the impact of a connected speaker becomes very small. 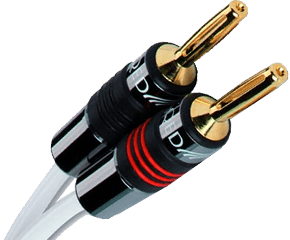 In addition the damping factor defined by the output impedance of the amp and the impedance of the connected speaker is less sensitive to the frequency as well. The high slew rate of the amplifier concept and the high quality LC Filter itself ensure a wide bandwidth and flat frequency response. 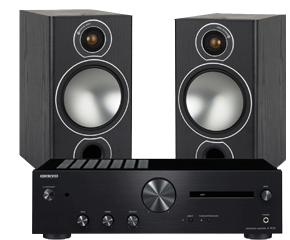 All adds up to an extraordinary Hi-Fi performance in a compact form factor. 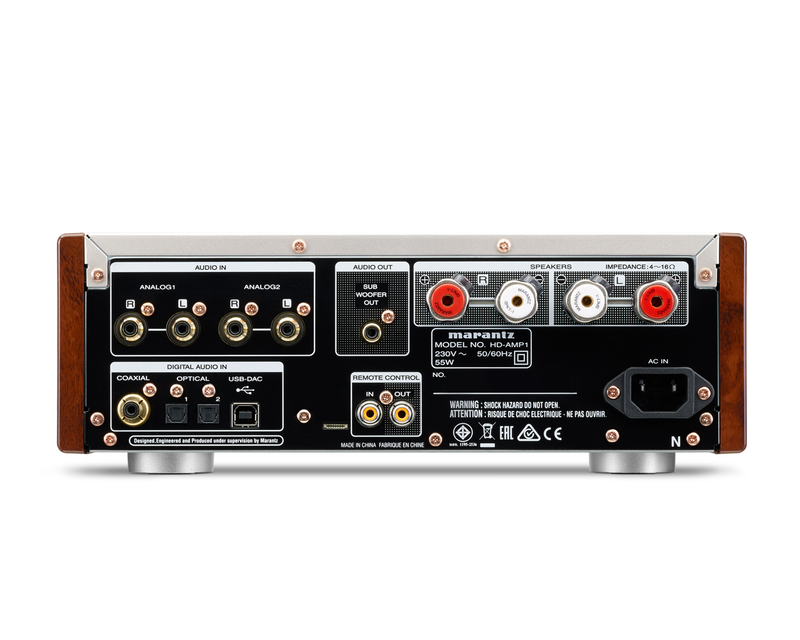 The HD-AMP1 not only builds on the famous Marantz sound, it is also highly connectable. Optical and coaxial digital inputs as well as a USB-B port enable you to stream music directly from a PC or MAC, or connect other digital sources. iDevices can also be connected via the USB port on the front. For even more connectivity, Marantz also included two analogue inputs. 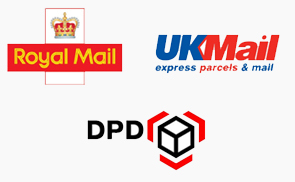 The USB-B works in asynchronous mode to support not only 384kHz/32bits high-resolution audio but also the DSD 2.8MHz, 5.6MHz and even 11.2MHz formats for maximized performance and the most direct way to enjoy excellent quality. To safeguard quality when connected to a computer, Marantz built extended isolation around the USB-B input to eliminate the chance of high frequency noise generated by the computer entering the HD-AMP1. For music lovers enjoying their favourite recording via headphone the HD-AMP1 features a high quality headphone stage with dedicated amplifier module HDAM-SA2. 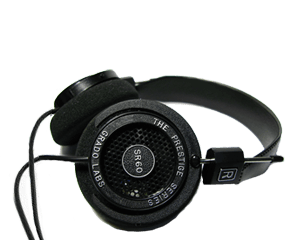 To work with a wider variety of headphones the gain factor can be changed from low to mid to high. By this it is possible to drive low to high impedance headphone without any problem. Without doubt, the HD-AMP1 is a feast for the ears. But it also looks good. The solid aluminum front is supported by a double layer bottom plate and side panels with retro-style wooden look. Information on volume, input, resolution, and more is shown on the stylish Marantz Porthole Display, clearly resembling the company’s renowned design. This is pure craftsmanship. The HD-AMP1 is housed in a dual-layer chassis featuring the addition of a bottom plate to the main chassis which suppresses any adverse effects of external vibration on sound quality. The feet of the chassis employ aluminum die-cast insulators to further absorb external vibration. The Marantz HD-AMP1 offers a powerful yet sophisticated sound from modern and legacy sources in a beautiful small-format appeal. 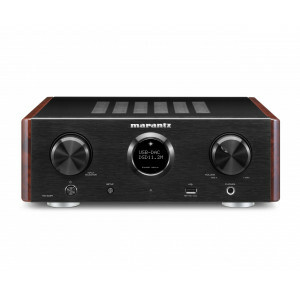 It accompanies the HD-DAC1 Headphone Amplifier with USB-DAC in the reborn Marantz MusicLink Series.